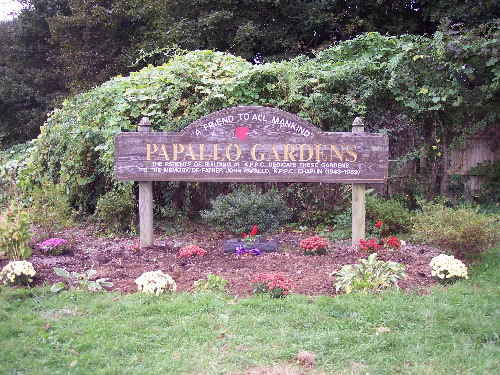 Father John Papallo, whose ancestors came from Martone, Reggio Calabria, and Amalfi, Italy, grew up in Meriden Connecticut as one of Nicholas and Florence Papallo's five children. In his youth, John was interested in two vocations, one the priesthood, the other a career as a classical singer. After graduation from high school in 1962, John entered the Hartford Conservatory of Music in Connecticut. After three years at the Conservatory, John continued his education at a number of colleges. It was while preparing for an audition with the Metropolitan Opera Workshop that John met Father Modestus Papi (Director of Holy House, Loretto, Italy) who encouraged John to join the Capuchin Order. John entered the Capuchin Novitiate in Milton, Massachusetts in 1971. After several years of study, John was ordained a priest in 1979. His education had prepared him to give counsel and spiritual direction to those in prison, mental institutions and in the parishes he served. In 1984, Father John was appointed to the staff of Kings Park Psychiatric Center to tend to the spiritual needs of the patients. On weekends, Father John celebrated Mass at St. Joseph's Church. He continued to take courses in Pastoral Counseling and voice lessons. Anyone who attended Mass at which Father John officiated will long remember his beautiful voice. Throughout his ministry, Father John exhibited a strong concern for those in need. He had a strong commitment to help the homeless, especially those trying to reenter society after treatment at the Kings Park Psychiatric Center. Tragically, Father John's life ended in an automobile accident on May 1, 1989. Father John is an inspiration to all of us in his commitment to help those in need and to strive to be all that you can be in your life.